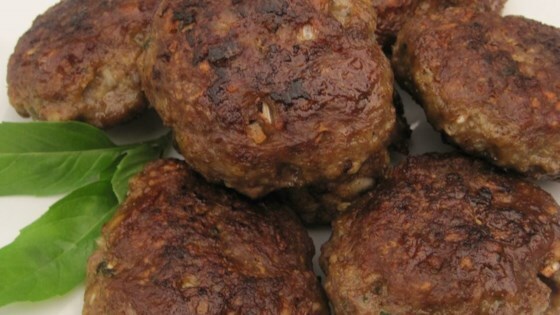 "While growing up, my Polish-Russian grandmother, who lived with our family, made these little meat patties quite often and they were a family favorite. Here is my rendition, from what I remember when cooking with Grandma, as she never wrote the recipe down. The patties were always served with mashed potatoes, green beans, applesauce, and, of course, plenty of ketchup for the patties." Mix ground beef, cracker crumbs, onion, egg, milk, garlic, kosher salt, and black pepper in a large bowl until evenly blended. Shape meat mixture into twelve 3-inch patties about 1 1/4-inch thick. Heat vegetable shortening in a large skillet over medium-high heat. Sear patties until golden brown, about 2 minutes per side. Reduce heat to low and continue cooking, uncovered, until patties are no longer pink in the center, about 20 minutes more. Remove patties from skillet and drain on paper towels until ready to serve. Grandma used to make these with Nabisco Royal Lunch Milk crackers...they have been discontinued for some years now. Instead, I used Heritage Mills Classic Lunch Milk crackers (made in Canada) which I purchased at my local Demoulas Market Basket store. However, any other similar milk cracker may be used in this recipe. If you enjoy a plainer type of meat patty, then this is for you. I personally enjoy things with more flavor. I would try a recipe with a lot more seasonings next time. The Kotlety turned out very delicious. What a great meal; it reminded me of my mom's kotlety.